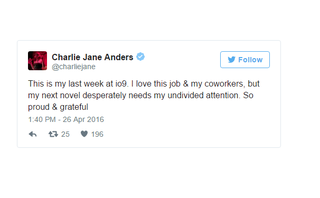 CJA announced on Twitter that she’s stepping down as editor of io9 to work on her next novel and that Rob Bricken is taking over. And does this mean Rob gets a badge and gun now? ETA: As Mika suggested, add links to your favorite posts of hers in the comments.